Spring is a magical time of year as bluebells come into flower and birds are busy building their nests, heralding the spring and early glimpses of summer. I work in our national fisheries team and so for me one of the most exciting things about this time of year is seeing adult salmon returning to our rivers after their epic migration. In late spring and early summer, adult salmon are returning to rivers to spawn (lay their eggs) while juvenile salmon (smolts) are heading in the other direction – out to sea in order to feed and grow. But neither journey is easy. The smolts face all the usual perils of any young creature making its way in the world, such as avoiding predators and finding food, in addition to having to make their way downstream over man-made barriers. Adult salmon face these same barriers, which can obstruct their progress upstream, preventing them from reaching spawning grounds. For hundreds of years, people have used water from rivers as a source of drinking water, to provide power and for recreation. This has left us with tens of thousands of weirs, dams and other obstructions, which make it difficult or even stop salmon and sea trout from swimming up rivers. These ‘barriers to migration’ are one of the main factors stopping salmon populations from returning to their former glory. But fortunately there are options for solving the problem at each obstruction. Sometimes we’re able to completely remove an obstruction, other times we can dig bypass channels to provide an alternative route for fish, or we can build a fish pass over the obstruction. But it is not possible for us to do this alone. 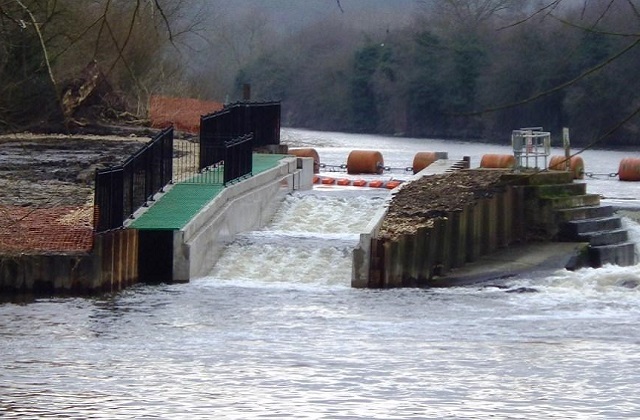 One recent success of removing a barrier to migration is a new fish pass on the River Tyne. 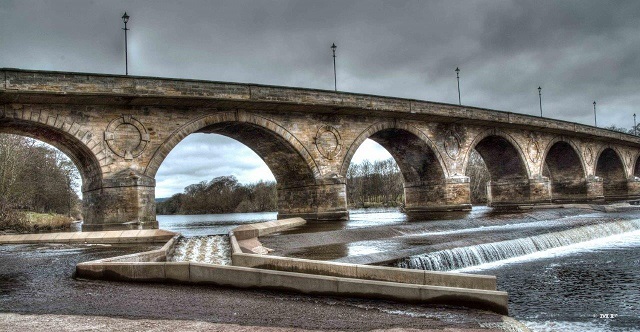 Here the Tyne Rivers Trust worked with Northumberland County Council and the Environment Agency to build Hexham fish pass which opens up access to many kilometers of spawning and juvenile habitat. It was fabulous to see it open earlier this year and it has had lots of positive feedback. Completing this challenging project was cause for celebration and it illustrates that when we give nature a helping hand it responds well. In fact, as soon as the fish pass was opened fish began to use it which I found an incredibly rewarding sight. So next time you’re enjoying the first flushes of spring, spare a thought for our iconic salmon, which face challenges throughout their lives, but with a little help from us – and our friends – are overcoming the barriers to their migration. Why have the ea left a half finished fish pass on the River Brock near Garstang for years denying all access to sea trout and salmon which are stopped by it from reaching the miles of gravel bed above it. They also spoilt the Barton Brook which flows into the Brock by dividing and canalising it into two ditches, ruining an excellent sea trout stream. The area team have commented that there was no exact location given, however based on the information given here is their reply. The only major obstruction on the river Brock is the Brock Aqueduct at SD 506340427. This weir was constructed on the Brock to facilitate the Lancaster Canal passing over the river via an aqueduct. We presume that construction was carried out at a similar time to the canal being built? The weir causes a complete barrier to migratory fish movement and has never to our knowledge had a fish pass, or has there been any attempts to construct a fish pass? The Brock Aqueduct has been highlighted as a barrier to fish migration, but as yet no funding has been found to work towards fish access by construction of a pass. It would possibly be one that we could discuss with Wyre Rivers Trust, but would ultimately rely on funding and the Canal and Rivers Trust who would have to take on some form of responsibility/liability should any future problems occur following construction of a fish pass. Elver passes have been installed on 2 small weirs on the River Brock at Brock near Bilsborrow SD 5121040564. The two weirs would not be an obstruction to migratory fish passage, though migratory fish could not reach this section as it lies upstream of the Brock Aqueduct. Barton Brook SD 5250737495 flows into `New Draught` a section of watercourse that we believe to have been modified many years ago in a flood relief scheme. The `New Draught` enters the River Brock SD 4753341084.